*This product is scheduled to launch early 2017. Even more slim and less-force style of niXaX™ . User Friendly Steak Tenderizer with Hand Finished Japanese Blades made in Japan. 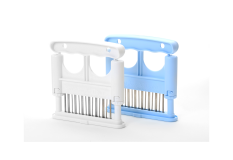 ​”Zig-zag” Arranged Blades Plates enables you making “crisscross” incisions very quickly. Protection Guide Pins protects the edge of the blades from sticking to the cutting board.